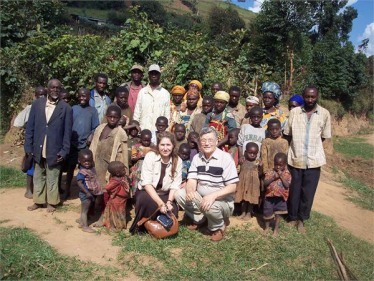 In August of 2006 we made another trip to Africa to visit several countries. Our first stop was to fulfill some requests to hold meetings in several cities in the Republic of Uganda, East Africa. After arriving at the Entebbe Airport, we traveled to the city of Kampala, where we had several days of meetings before going on to the city of Rukungiri. 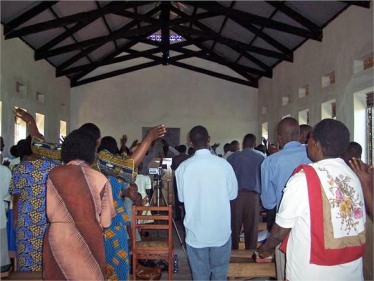 It was during these meetings that I was also invited to go outside the city limits and speak in a church. Between the meetings, we went on tour. We went to Lake Victoria. I was told that it is the second largest fresh body of water in the world and that the source of the Nile starts right there as the water leaves the lake. And as we traveled on down the Nile, they showed me there were seven more different springs of water coming up from beneath the river. I could see that each spring was shaded in a little different color and the water from them all was whirling around and around coming up out of the earth. This river just keeps on going and doesn't complete its journey of four thousand miles until it winds up in the Mediterranean Sea, which takes about three months to complete. So I ministered on a message there in Uganda entitled, An Unbroken Stream of Revelation, and I used Lake Victoria as a type of how the message comes from God to all the members of the wife of the Lamb. The lake is a source of pride for the people there. There are many people that make their living from the marine life in it because it's a huge lake. In order to type it out with God's dealings with us in this gospel, I told them that God is like that Lake Victoria. The source of the Nile starts from Lake Victoria and it keeps running. I tell you there is a River of Life running today, friend. It is running out to many peoples, nations, tongues, and kings who will hear the Word. God sent a message starting in the Laodicea Church Age with a prophet messenger named William Branham, who was the seventh church age messenger. That was the beginning of the flowing of the water source from the throne for this message that the Apostle Paul announced would be here to get a wife for God's Son. And that water keeps flowing as we continue to walk on in revelation as more and more Word is revealed, until it completes itself in three phases with the marriage and rapture taking place at the last trump (Matthew 25:1-13, 1 Thessalonians 4:16, and 1 Corinthians 15:51-52). This is what Paul said would happen, and even now we are seeing it come to pass. After this meeting, we began our journey to Rukungiri where we came to the equator line at Kikutizi Mpigi District. Here is where we stopped to rest a bit. And while looking around, we found that on one side of the equator line the water would turn clockwise when poured through a funnel into a container. Then on the other side of the line, it would turn counter-clockwise. But right in the center of the line, the water would not turn either way; it poured straight down. Standing there we were geographically equi-distant from both the North and South Pole, which is 9,640 kilometers (6,025 miles); and were 1,267 meters above sea level (3,800 feet) and 0 degrees latitude-32 degrees longitude. The average temperature is 22 degrees Celsius (72 degrees Fahrenheit). Our weight was 3 percent less at the equator line and we were revolving 2,409 miles around the globe at a speed of 1,040.6 miles per hour on the earth's axis. We really liked the fact of weighing 3 pounds less. So while standing there with one foot in the Northern Hemisphere and one foot in the Southern Hemisphere where the sun rises and sets directly above the equator line and where the line N/S (North meets South), I had a thought come to me, "Where two ways meet." And as we traveled towards Rukungiri, the revelation of it kept growing. When we arrived in Rukungiri, we were greeted with open arms. The first message I preached to the saints, of course, was entitled, Where Two Ways Meet, where I took my text from the Book of Mark 11:4. It says, "And they went their way, and found the colt tied by the door without in a place where two ways met: and they loose him." I expounded on the Word of God by the revelation that came to me while we were on the equator line where the water was turning on both sides of the line, but it was contrary to each other. It couldn't get together. But right in the middle on the line the water wasn't turning either way. There was perfection. Both of those forces got together - where two ways met - where the North met the South, and here we even weighed less. "Wherefore seeing we also are compassed about with so great a cloud of witnesses, let us lay aside every weight, and the sin which doth so easily beset us, and let us run with patience the race that is set before us." We lay aside every weight; there is nothing contrary. That is the way the church of the living God is, no longer tossed to and fro. As long as we were tossed to and fro, we were going in different directions. That is the way the church has been doing. But when we come together with one mind (the mind of Christ) and in one accord, there is no longer two forces pulling at us. We have one mind, one Spirit, and one gospel. We no longer have ideas and opinions of men that are denominational teachings. As we look at the denominational religious systems of the world, one will teach you to go one way, while others will teach to go another way. But God's Word is perfect. It is where two ways meet. And that is where perfection lies. There is nowhere else that we can find perfection. We come to the place where we recognize our way and God's way. And we know that our way doesn't mean anything. We see that all the denominations of the world are twisting and turning; because they are on one side of the spiritual equator or the other side. And like the water they can't help themselves, so they continue to go in circles. But the predestinated seed of God travels right in the middle of the road where there is perfect peace inside the body of Christ. (Ephesians 4:13) This is where the Word of God is at. This is where the power of God is at. This is where perfection is at. This is where all things are possible. We don't have the pull of the world on us anymore. We don't have the pull from the North and we don't have the pull from the South, as we've found the place of perfection in the middle of the spiritual equator line where the water pours straight down without any external pulls; not turning to one side or the other side; no longer tossed to and fro with every wind of man's doctrines where they lie in wait to deceive. But we have come into the knowledge of the Son of God, unto a perfect man, unto the measure of the stature of the fullness of Christ. And this is our hiding place. 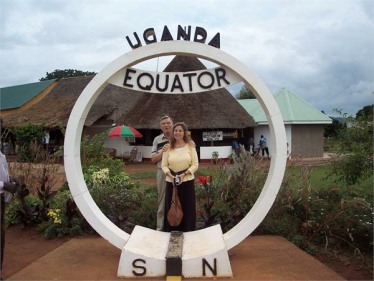 After we finished the meetings in Rukungiri, we took a few days for rest and did some sightseeing. We also went to visit with the Batwa Tribe in the Bwindi Rainforest before starting our long journey back to Kampala. The Batwa Tribe is one of the last groups of short-statured people known as the pygmy people and sometimes called Forest people. When we arrived in their area, we met a man that went to tell them that we were there to see them. They came down from the mountain where their village was located. It was easier for them to come to us than for us to climb the mountain. They were happy to see us. I preached with an interpreter to a small congregation on the side of the road about how great our God is and how He manifested Himself to us by sending His Son, the Lord Jesus Christ, who died on the cross to save us from sin. I pointed out the mountains and the lakes and the beautiful landscape and how God created it all for us to enjoy. I spoke in simplicity to these simple and gracious people and prayed for them. Which in turn they sang for us, telling us that we were welcome among them. We wished we could have stayed longer, because we all had a wonderful time! It was unsafe to be in the mountains at night, so our driver urged us to begin our journey back to Kampala before it got dark. So our travel began again. We had only gone a short distance before dark began to set in. We realized that we had stayed in the rainforest too long and that night was going to catch us. Our driver had been driving so long that he began to fall asleep at the wheel. Finally, he asked me, "Can you drive a car?" I told him, "Yes, I can drive, but I've never driven a vehicle with the steering wheel on the right hand side, or drove on the opposite lane than we do in the United States." So I was very hesitant. I didn't want to take a chance and maybe get us all busted up in an accident. Then suddenly he turned to my wife and asked her, "Sister, can you drive?" She and I just looked at one another as we were thinking the same thing, "What are we going to do?" Then to my surprise she said, "Of course I can!" She didn't know if she could or not, but she was getting a little afraid and was wanting to get out of the mountains and back to the city, and also she was trying to help me. I didn't know if she could do it or not, so I held my peace. So she swapped places with our driver, and he got in the rear seat and fell asleep immediately after telling us that we couldn't possibly get lost, as that was the only road out. We had to go very slowly, the lights on the vehicle were not very good, so we were having a lot of trouble seeing the potholes in the road. So after traveling many hours with me guiding her through all the potholes and us breathing all the dust (the vehicle didn't have an air-conditioner), we finally arrived in the city of Kampala a few hours before sunrise after about 20 hours of preaching, sightseeing, and travel. At the city limits we woke the driver up and he drove us on to our hotel for a bath and rest. We were totally covered from head to toe in dust, and about all you could see of us was the whites of our eyes. We had one final meeting the next day before leaving for the countries of Malawi and Mozambique. We were totally exhausted by our ordeal; and yet, it was extremely exciting! This final meeting we had in Kampala, I preached a message entitled, Tried by the Word until the Word Came. I took my text from the Book of Psalms 105:19 where it says, "Until the time that his word came, the word of the Lord tried them." The Word came to them that had been tried by the Word. That's what the Bible says, "God gave them the Word until the Word came." What is the Word? The Word is not just something that you read with your eyes; but it is something that you understand with your heart. The Bible is the hull of the Word (the body of the Word), but the body of the Word is dead without the Spirit of the Word. We've had the written Word all along the way, but now the living Word has come. The Bible says in John 1:1-2, 14, "In the beginning was the Word, and the Word was with God, and the Word was God." "And the Word was made flesh, and dwelt among us, (and we beheld his glory, the glory as of the only begotten of the Father,) full of grace and truth." Now that is the Word. This written Word we've had, much of it is fulfilled; and we understand there is much yet to be fulfilled. But there is something (the Word) that is living, breathing, talking, and walking Word. Even as Paul said, "Ye are living epistles." We are the Word. If we have only the letter of the Word it will kill; but it is the Spirit of the Word that will give life. John 2:22 is a very enlightening scripture that was quickened to Jesus Christ's disciples after He raised from the dead. It says, "When therefore he was risen from the dead, his disciples remembered that he had said this unto them; and they believed the scripture, and the word which Jesus had said." In this scripture we have both the written Word and the living or spoken Word. So the disciples had the scripture (they were tried by the Word until the living Word came), and then they had both. It's the same thing now. We had the scripture; we were tried by the Word until the living Word came to us in the form of the little book of Revelation, Chapter 10, and we were told to take it (the living Word) and eat it up. And now we have both the scripture and this last trump message. After everything had been said and done in Uganda, we left for Malawi and Mozambique. We stayed several weeks in Africa and then returned home to Dawsonville, Georgia, knowing that the Word of the Lord was growing, multiplying, and prevailing. 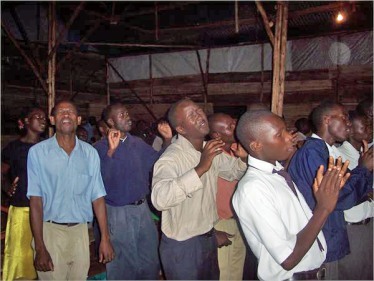 Below are some of the audio and video messages that were preached in Uganda.